“I think I’m falling out of love with you.” Those words from Greg Bodin’s wife, Sandy, shook Greg to the very core. But although he was initially shocked by Sandy’s words, as he thought more about it, it made sense. Greg realized that he had pretty much checked out of his marriage, especially since their second son, Leo, had been born. around that time, Greg had gone to work for his father-in- law’s contracting business. checked out of any family responsibilities other than bringing in a salary. The events that led up to Sandy’s statement actually began back in Greg’s early teen years. rebelling against the faith he had been taught since childhood, Greg ran from God all the way through high school and into his adult years. When it came time for college, Greg eagerly left home for Loyola University. That’s where he met Sandy. When it came to matters of faith, he knew that she had been raised catholic, and she knew that he was “evangelical,” whatever that meant. “Then our second child—a colicky baby who brought more challenges—was born, and that’s when I really checked out,” Greg admits. With their first child, Greg’s hands-off stance was okay with Sandy. “as a mother, I thought I would just do everything. and I did it all without his help. But our second one cried for three months straight. If he wasn’t sleeping or eating, he was crying. And that’s when the fights would start. With Sandy’s stunning statement still ringing in his ears, Greg was in his car, driving their older son, eddie, to a visit with his grandparents. Between the time he and eddie left their home in Bartlett and the time they arrived at the home of Greg’s dad and stepmom in North aurora, Greg did some serious thinking. It was during that car trip, Greg says, that he had a strong awareness of God’s presence, telling him that it was time to stop living for himself. “It was clear to me,” Greg said, “that the only way my marriage could be saved was through the love of God and the power of Christ—because there was nothing I could do. “I could see that I had fallen into an unhealthy pattern of withdrawing, even being emotionally abusive to Sandy,” Greg admits. As he approached his dad’s house that day in May of 2011, Greg heard the holy Spirit telling him that he needed to ask his dad and stepmom to pray for him. “I said, ‘Listen, guys, would you pray for me?’ and they knew immediately what was going on. I had been running from the Lord for my entire life up until this day. They knew God was working in my life and that he was calling me back to him. Not long after that, he began to look for a church. Greg does a lot of driving in his job and had seen Wheaton Bible church as he drove down North avenue. when he went to the Internet to research churches, he was pleased to learn that the church also had a Spanish congregation—a church where Sandy’s parents, whose first language is Spanish, might also attend. Early on, Greg came by himself and brought four-year-old Eddie, who would sit beside him and color during the service. Later Greg was so determined to get Sandy to church that he became a helper in the “Lil Fish” room for toddlers Leo’s age. Slowly she began to listen and understand, but Greg’s sudden transformation gave Sandy a lot to think about. Their marriage had been seriously damaged at that point, with no commu- nication other than arguments, Sandy recalls. Then suddenly, Greg was a changed man. “When he said he was going to dedicate his life to Jesus,” Sandy remembers, “that was like a punch in the stomach to me. This whole time we were having problems, I wanted him to focus on me. Now you’re going to focus on Jesus? I need you to focus on me! “We needed to work out our issues. he’s got all these books to read, but I didn’t understand that he needed to do the reading and Bible study to become a better husband and father. It was hard for a while. “I was also fearful of the holier-than-thou thing. Now, all of a sudden, he wants to be my spiritual leader. our communication was so broken, I didn’t understand what he was trying to tell me.” Greg’s actions, however, sent a much clearer message. “You sit in the service, and I’ll take care of Leo,” and, “I’m going to be in charge of loading the dishwasher.” Those words got through to Sandy. Over time, Sandy saw the change was real. after he first came to WBC. he had realized that as good as Sunday services were, he needed more—and remembered how his dad had always talked about the importance of fellowship and Bible study. When the new studies started up the following January, he wanted Sandy to have the same kind of experience. So, with her reluctant permission, he signed her up for the Tuesday evening Place 4 You women’s study, where she was assigned to a discussion group led by Cindy Judge. Even though Sandy feared the other women would be judge-mental, “I was very honest with them,” she recalls. “I thought I’d be in the Bible study and everybody would be holy, holy. Cindy Judge was Sandy’s table leader when she first came to Place 4 You. Cindy has since become Sandy’s mentor and friend. As she read and listened and continued to attend the Bible study, Sandy was doing battle with accepting all she was learning. Happiness hit her like a train on a track. Coming towards her stuck still no turning back. She hid around corners and she hid under beds. She killed it with kisses and from it she fled. Run fast for your mother; run fast for your father. Run for your children all your sisters and brothers. Leave all your love and your longing behind. You can’t carry it with you if you want to survive. The dog days are over. The dog days are done. Can you hear the horses, ’cause here they come. And I never wanted anything from you. Except everything you had and what was left after that too. Oh! Happiness hit her like a bullet in the back. Struck from a great height. By someone who should have known better than that. The dog days are over. The dog days are done. I never wanted anything from you except everything you had. And what was left after that too. The dog days are over. The dog days are done. God spoke through the words of this song, and Sandy’s response was to stop resisting and surrender herself to him. The release was real. Before that day, Greg had shared the plan of salvation with Sandy and had even led her in a prayer to accept Christ as her Lord and Savior. The peace came that night, as Sandy surrendered her life to Christ. She saw some immediate changes. The first thing she noticed was that her language had changed. and she could finally really pray to this God she hoped to know. That walk began the night “the dog days” were over. Sandy’s parents hadn’t attended church themselves for many years, but when Sandy and Greg invited them to visit Iglesia del Pueblo last Thanksgiving, they came—and returned again and again to attend services in their native Spanish language. Sandy initially wondered what they would think about the contemporary music, since their past church experience was with the more solemn catholic mass. She reports that her mother loves the music, and while they don’t yet participate, they stand and listen—and they continue to come on Sunday mornings. her dad, too, is enjoying the services, telling Greg that he likes it, especially how Pastor hanibal speaks with authority as he explains Scripture. 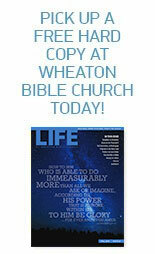 This entry was posted on March 10, 2013 by Wheaton Bible Church in Spring 2012.